Matthew called in sick this week, so it came down to Dean and Josh to discuss the bountied film (thanks Michael Claudio!) 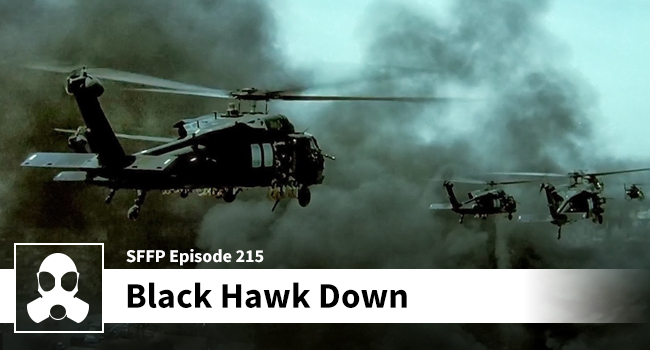 Black Hawk Down. The lads try their best to be entertaining this week, but if we’re being honest, this is heavy material. Despite wishing terrible things upon Legolas (not Blackburn), and having a laugh at Orlando Bloom’s expense, most of this episode was talking about the awful situation that unfolded at the Battle of Mogadishu. Josh’s perspective (as always) was invaluable but especially as it relates to understanding how missions are planned. Dean did some of his own research and listened to a couple interviews from Michael Durant (Pilot of Super Six Four), and US Ranger (PLT LDR), Larry Moores. Although the material this week is heavy, it was an honor to speak of the courage of the men who found themselves in an unthinkable situation in 1993 on October 3rd and 4th.